Maxilead Metals has a state of the art scrap metal recycling centre based in Manchester that serves the North West and the rest of the UK. Designed for low volume waste disposal, the 10/12 cu Yard Enclosed Chain Skip is ideal for the disposal of high quality grades of scrap metal. Suitable for both outdoor and indoor use, Maxilead Metals’ enclosed chain builders skip provides a safe and secure containment solution for your high-grade scrap metal. 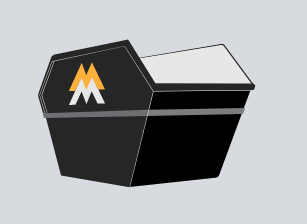 What can the Maxilead Metal skips be used for? To order a skip for your metal or to find out any more information, contact us today!